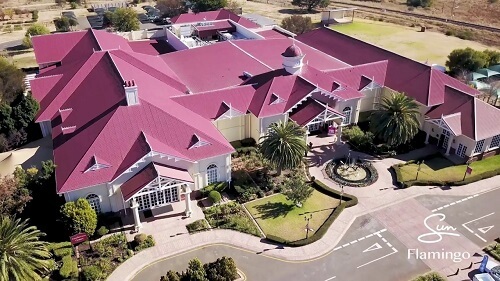 The Flamingo Casino, located in Kimberley, Northern Cape is a recreation of the historic diamond rush era. The casino is named after the flock of flamingos that live on the nearby Kamfers Dam. Flamingo Casino is operated by Sun International and should be on everyone’s list of things to visit in Kimberley. This oasis shows you that there’s more to this former mining town than the hole and we show you why below. The cosy casino has 300 state-of-the-art coinless slot machines, video poker games, and ten casino tables with roulette and blackjack. Open 24/7, visitors can try their luck at Flamingo Casino at any time. The casino is divided into smoking, non-smoking, and exclusive Prive area for the high rollers. While Flamingo Casino itself doesn’t have its own hotel, there is the Road Lodge which is adjacent to the casino. It’s a 90-room hotel that’s perfect for business trips or getaways. The hotel is in a Victorian-era buildings but it has modern amenities like Wi-Fi, swimming pool, satellite TV, air-conditioning, and room service. For wholesome and delicious steakhouse meals, head to the Harvest Grill & Wine. It’s a family-friendly restaurant serving some of the best food in town. For those looking for a more exciting night out, Bar 129 is the place to be in Kimberley. Enjoy drinks and light meals with friends while watching the latest sports showdown on TV. Also, Bar 129 is the live entertainment venue at Flamingo. Enjoy karaoke, live musical acts, and stand-up comedy. If you’re travelling with children, there is the Flambino’s Creche and Kids’ Zone, which will keep the little one’s entertained while you make play real money casino games. Professional childminders supervise the area and they accept children from ages two up to 17. There are a wide range of activities and games to keep them entertained. Looking to unwind? Then the Royal Spa is the perfect place to visit. The spa offers full body massages and rejuvenating treatments. Guests can also get their hands and feet treated. Also, there is a communal jacuzzi and sauna. There’s the 18-hole golf course for those who enjoy spending their free time at the golf course. The course, opened in 1890, spreads across semi-desert terrain and offers a challenging round. Learn more about Northern Cape casinos and casinos in South Africa with Casino ZA.